Make the switch. It’s easier than you may think! Three simple steps to make HUECU your primary checking account. Open your new HUECU checking account. 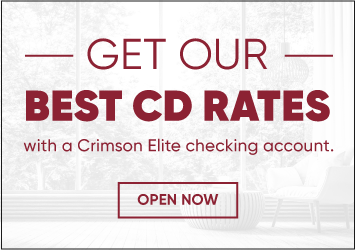 Our Crimson Checking Accounts come in several configurations so you can select the features and benefits that matter most to you. Find a checking option that meets your unique needs. Switch your transactions to your new account. Set up direct deposit to HUECU through your employer’s payroll platform. Harvard employees can view instructions for PeopleSoft updates here. Switch your automatic withdrawals/payments to HUECU. Visit business websites that you currently have automatic withdrawals/payments set up and update your information to your new HUECU account. Let outstanding checks and automatic withdrawals clear your old account. Leave money in your old account to cover outstanding checks. It may take several weeks for everything to clear. Once all outstanding checks have cleared your old account, we recommend you visit or call your financial institution to close your account and request a check for the remaining balance. Once you have closed your account, shred unused checks and cut up your ATM/Debit Card. Now you can fully enjoy your HUECU checking account. Questions about moving your checking account? Contact us at 617-495-4460, huecu@harvard.edu or visit one of our branches. And remember, membership is good for life – even if you move or change employers, your money will always be easily accessible. branch & atm locator Over 5,000 shared branches and surcharge-free ATMs.